Can the Millennial Kingdom be found in the Old Testament? Dr. Reagan: Many people believe the only place in the Bible where the Millennium is mentioned is in Revelation 20. In fact, I even had a guy say one time to me, "It's only mentioned in one chapter of the Bible, so, so what?" Well, to me, if it's mentioned in even one verse, that's important. Are there any references to the Millennium in the Old Testament, or is this strictly a New Testament concept? Al Gist: The Millennium is not strictly a New Testament concept. In fact, there's more mentioned of it in the Old Testament than there is in the New Testament. It was a favorite topic of the Old Testament prophets. I'll just give you a few examples, because they are so numerous we couldn't possibly cover them all. For instance, in Daniel 2 the Bible tells us that the Lord is going to come back. Daniel says, "He will destroy the empires and the kingdoms of men, and then He will establish His kingdom which shall last forever." By far the major topic of the book of Isaiah is about the Millennial Kingdom. Isaiah talks about it being a world-wide kingdom and a great day of peace. In Isaiah 2:4 it says, "Men will beat their swords into plowshares and their spears into pruning hooks." And he says, "Nation shall not lift up sword against nation, neither shall they learn war anymore." Isaiah talks about how God is going to remove the viciousness of nature so that the wolf will also lie down with the lamb and so forth. It says in Isaiah 11 it will be a time of great agricultural abundance. And, according to Isaiah 35, the desert will blossom like a rose. Isaiah is literally replete with descriptions of the Messianic Kingdom, just as Ezekiel and most of the other prophets are. Zechariah is the one I think who puts the cap on the topic. Zechariah really sums it up well. In Zechariah 14:9 it says, "And the Lord shall be king over all the earth and that day there shall be one Lord and His name one." I can only say to that — Hallelujah! I can't wait when the whole planet will know who is in charge, and it will be King Jesus. Dr. Reagan: When you were talking about Isaiah, it reminded me of something about him. Isaiah had visions, dreams and direct revelations from God about the Millennial Kingdom, just one after another. When you get over to the end of the book in Isaiah 64:1, he suddenly screams at the top of his voice and says, "O, that you would rend the heavens and come on down!" Listen, I want this to be a reality, Lord. Dennis Pollock: Let me share a little bit from Isaiah 24. Isaiah 24 is in many respects a parallel to the Tribulation as you read it in Revelation. Isaiah goes through some tremendous descriptions of the agony the earth and all the kingdoms will experience. Let me just share a few of those. I know we are talking about the Millennium, but we'll get to that in just a moment. Isaiah starts out by saying, "The Lord makes the earth empty, makes it waste, distorts its surface, scatters abroad its inhabitants." Then he goes on in verse 5, "The earth is defiled under its inhabitants." Verse 6, "The curse has devoured the earth." Down to 17, "Fear in the pit and the snare are upon you, o, inhabitants of the earth." Verse 19, "The earth is violently broken, the earth is split open, the earth is shaken exceedingly, the earth shall reel to and fro like a drunkard." That is just the most graphic, violent language you could imagine to describe. Also, it speaks about the kingdoms of the nations, so this is not just a local judgment on some particular community. The Millennium is in the very last verse after going through this tremendous description of violence on the earth where the earth will go through this terrible catastrophe. Isaiah says in verse 23, "The moon will be disgraced, the sun ashamed, the Lord of host will reign on Mount Zion in Jerusalem.... then before his elders gloriously." As we think about these Millennial passages and a number of others, the question you have to ask is, "Has this happened yet?" Of course the answer is obviously no, it hasn't. Has Israel been elevated? Has the mountain of the Lord's house been exalted above the nations? And the answer is no. So, if it hasn't happened, but God says it will happen, what is the obvious conclusion you have to draw? It's going to happen. This is a prophecy that will be fulfilled. Of course, people who study Bible prophecy and think about it and compare Scripture with Scripture and read and write books and get involved in the whole subject almost all come to these same conclusions — there will be a Millennium. The Amillennial view is the premier choice for people that don't like to think too much about it, but if you go with the people who really study the prophecies and really think a lot about the Lord's return, it always leads you to this idea that Christ is coming back after a terrible period of destruction on the earth and He's going to reign not in Washington D.C., not in Nairobi, Kenya, but in Jerusalem for a thousand years. Nathan Jones: I'm so looking forward to the Millennial Kingdom, because it will be a time of peace and righteousness and justice. Living on this earth now is like having itching powder on you. Life's itchy, it's scratchy, you're tired, your eyes are watering, but in the Millennial Kingdom it's a life of peace and righteousness. You don't have to watch your back. We're not carrying guns for defense. What I also like is how Isaiah 65 says, "I will rejoice in Jerusalem, be glad in my people, the sound of weeping and crying will no longer be heard in her. In her a nursing infant will no longer live only a few days, or old man not live out his days. Indeed the youth will die at 100 years and the one that misses a 100 years will be cursed." So, we'd have to have a Millennial Kingdom, because people are going to be living as long as a thousand years. We will have the Noahic lifespans back. Also, we as believers in Christ are promised that in our glorified bodies we will reign with Jesus. There are all sorts of verses that talk about that, where we reign with the Messiah and reign with Jesus over the world. I can't tell you how much I'm looking forward to that time period! Dennis Pollock: So many times, you'll hear a worship leader say, "Well, you better enjoy worship, because we're going to be singing forever." Basically, we'll be singing 24/7 when we get to Heaven, they believe. But, the Bible never says that we'll sing with Christ forever. It says we will reign with Christ forever. Dr. Reagan: Yes, it's going to be wonderful. I think of Ezekiel 48 where it talks about the New Jerusalem that will exist during the Millennial reign. Ezekiel says that the name of Jerusalem will be changed to Yahweh-Shammah, which means "the Lord is there." Jesus is physically going to be there in His gloried body. He's going to reign as King of Kings and Lord of Lords. He's going to have David in his glorified body. David is going to be resurrected to reign as the king of Israel. We in our glorified bodies are going to be scattered out all over this earth for the purpose of reigning over those who are in natural bodies. Those believers at the end of the Tribulation who are brought into the Millennium in the flesh will be reigning over them. Everybody on this planet who's in a position of authority — kings, presidents, prime ministers, mayors, school boards, city councils, all of them — will be made up of people in glorified bodies. Dennis Pollock: Dave, are you saying there will be no separation of church and state then? Dr. Reagan: I'm saying, teachers will teach everything out of the Word of God and nobody will be there to say, "Separation of Church and State," because there will be no separation of Church and State. It's going to be a theocracy. The result is that the earth is going to be flooded with peace, righteousness and justice as the waters cover the sea. For that reason, I get up every morning and shout, "Maranatha, Maranatha, come quickly Lord Jesus. Amen!" 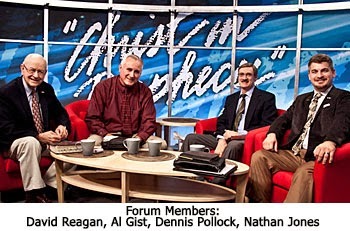 In the third segment of our forum on the Millennium, we'll ask our Bible prophecy experts what the problems are with the Amillennial interpretation of the Bible.